Hello there! We’re back again with another cooler brand to talk about. Today, we’ll be looking at Fatboy Coolers. Now, I find the name interesting. After all, most cooler brands have names that you can almost immediately figure out the inspiration behind. Take Yeti, for instance: The Yeti, also known as The Abominable Snowman, is a mythical creature known for living in predominantly cold and snowy areas. That would be an appropriate name for a cooler brand. The orca, also known as the killer whale, is a dolphin-like sea mammal that lives in predominantly cool waters. That is also an appropriate name for a cooler brand (ORCA Coolers). It’s not always about the cold though. Kong coolers are named after the King Kong because they’re supposed to be tough. Pelican coolers are part of the broader product offering by Pelican, so they just had to take on the family name. Fatboy, however, I cannot explain for the life of me. Now, I won’t try to speculate on why these coolers are called Fatboy coolers, but I will say it sounds (and looks) pretty darn cool! That said, there isn’t much to be said about the people behind this cooler. Their website doesn’t have an ‘About Us’ section and there’s a dearth of information on the internet about the founders. This company, however, has racked up quite a good reputation since its inception in 2016. So, while this would be a red flag under different circumstances, it doesn’t really matter right now. I’ll give the cooler props for the little things it includes. The features aren’t grand or absolutely next-level, but they’re really thoughtful. From the vacuum press to the specially designed drain plug, you’ll feel taken care of by this cooler. It’s almost like they don’t want you to do any work because they’ve already done a lot for you. Almost like they’re encouraging you to be sedentary… like a… Fat boy… Anyway, let’s not get carried away. We’ll get straight into the details of this awesomely designed (and named) cooler! The table below shows a lineup of Fatboy Coolers roto-molded ice chests with all necessary pieces of information in one place. Later on, you will get detailed review including design and features, so that way you can make an informed decision when you make your purchase! 37.5" x 19.5" x 19.5"
Okay, so here’s where we get down to action. This cooler looks like your average cooler from afar, but upon taking a closer look you quickly learn that it’s anything but average. One of Fatboy’s strongest bragging points when it comes to their hard coolers is the fact that they’re rotomolded. In fact, I think this cooler nails the whole roto-molded construction so well that I’m going to give you a bit of an in-depth explanation of what, exactly, roto-molded means. Roto-molding, also known as rotational molding, a kind of process used to form plastic. It is characterized by high temperatures, low pressures and, as we’ll see in a bit, rotation that helps to achieve the one-piece body. Fatboy uses this method and it is what makes their hard coolers so strong and durable. Plus, a one-piece construction dramatically increases ice retention times, making them hold ice for longer than coolers that were made from other plastic forming processes. TIP: Here are some premium roto-molded coolers reviewed by us. 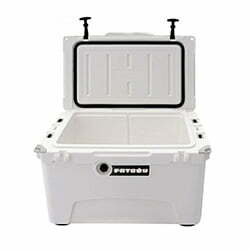 The life of a Fatboy cooler begins as a mold which is loaded with a powdered form of polyethylene. It is then heated in a large oven, all the while being rotated along two axes (bi-axial rotation). That rotation is what makes roto-molded coolers so strong. It allows the plastic to spread evenly throughout the mold, ensuring consistent thickness in the walls and stress-free corners that are very strong. Once the polyethylene has adhered to the mold, the mold is removed from the oven and allowed to cool. The Fatboy cooler body is then removed from the mold and finally ready for more processing. The Fatboy cooler body at this point is still nothing more than a hollow piece of plastic. A good looking one, of course, but not much beyond that. The cooler core is lined with insulating foam, which is what helps keep the internal temperatures consistent for up to 10 days. The beauty of roto-molding is that the cooler is constructed as one piece. It doesn’t consist of many parts attached to each other, which can allow air through and cause inconsistent internal temperatures. Fragmented construction also leaves the body prone to damage since now it’s only as strong as its joints, no matter how strong the individual parts are. 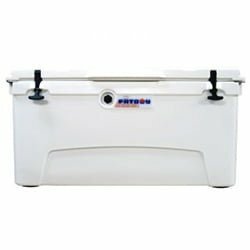 Roto-molded coolers are at once both strong and durable and will keep your ice cold a lot longer. That said we like the strength on this cooler. We tried to perform a drop-test on it from about 20 feet and couldn’t find as much as a scratch. Okay, maybe one scratch, but we had to look really hard. When it comes to features, there are a lot of things we loved about this cooler. Let’s start with the lid. It is slip resistant (10) and holds well in place. One of the problems we have with other coolers is how you have to rest the lid against something when you open it to stop it from slamming shut. More often than not you’ll have to hold it with your hand when rummaging for something deep in the chest. Not so with the Fatboy cooler. It stays in place and requires a bit of force to swing open and shut. We also love the T-rex latches (2). They are industrial grade latches that hold the cooler tightly shut. 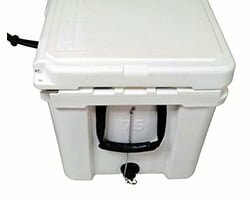 With other coolers, the latches can feel pretty loose and might have a tendency to come off too easily. This becomes a problem when you load the cooler in the back of your truck and then take it for a bumpy ride. You get to your destination and realize your cooler latches came undone somewhere on the way and all of your ice has melted. You won’t have that problem with the latches on your Fatboy. We also love the handles (5) on the Fatboy. They’re made out of Polyethylene and are removable. A lot of cooler brands boast about their nylon rope handles and how strong they are. Well, we actually compared the handles on the Fatboy to those on some other coolers, such as the RTIC, and they feel as strong and as easy to remove as in the case of RTIC. These things should last you a lifetime. We couldn’t get enough of the corners you could lock. 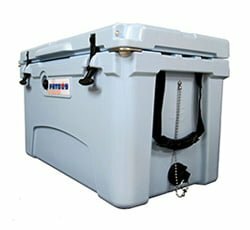 If you don’t want unauthorized people, or animals, getting into your Fatboy ice chest, then you’re going to love the fact that you can slap a padlock on the lockable corners (4) and walk aware feeling secure. On top of that, the front corners also double as bottle openers (1). Other features we really appreciated were the non-skid bottom feets (9), the molded ruler (7) on the top, the drain plug, and the vacuum release. I’ll talk about these last two in depth. Let’s start with the drain plug (6). Again, something I don’t like about many cooler brands is the small drain. You have to wait an unimaginable length of time just to drain the water out. As if that’s not enough, you also risk losing the plug on most coolers because that’s really all it is; a plug. With the Fatboy, it’s much different. To begin, the plug is tethered to the cooler by a stainless steel chain. That means that when you unwind it you can leave it hanging there and don’t have to worry about losing it. That’s a plus in our book. There’s another great advantage with the Fatboy drain. It comes in two levels. You can remove the top plug, which is shaped like your regular garden hose, for a slow and high-pressure drain. At that level, the hole is about the same diameter as in just about every other cooler. You can go a step further and remove the second lid as well, revealing the full drain hall. This hall is a lot wider than the average 1-inch drain hall that you’ll find on other coolers. It’s about an inch and a half in diameter. That means you water rains much faster. But it doesn’t end there. As if a great wide drain isn’t enough, Fatboy went further and added a vacuum release button (3). When you try to drain water out of a cooler, air forces the water to come out in spurts and bursts. This makes for slow drainage. With the Fatboy, you get a vacuum release button that lets the air in via a different passage so the water can come out more smoothly. As a result, it drains much quicker. I really feel like this double feature is just about the coup dé grace that Fatboy deals on quite many other coolers. Finally, we look at the ice chest itself. In the lid alone you find an industrial grade gasket (11) that helps to keep all that temperature, or lack of it, on the inside of your cooler where it belongs. Inside the ice chest, you get two trays where you can place various things. These help you separate stuff from the ice, such as meat and fish. You also get a cutting board that acts as a divider, cutting the chest into two down the middle. On the sides are two cup and bottle holders for any extra drinks you might want on the outside of the cooler. When it comes to ice retention, Fatboy coolers try very hard. The largest one, the 75 quart one, can hold ice for up to 8-10 days, depending on conditions like weather, temperature etc. That’s pretty good for a cooler that not many people know about. To wrap up, this cooler should be okay for trips into the wilderness, or elsewhere, that doesn’t go past a week. Just fill it with ice, consider adding some good cooler ice packs to gain a little more of ice retention time and take it with you into the wild. Fatboy coolers come in 5 sizes. 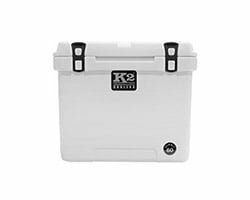 For most entry-level coolers that we reviewed this year, there are usually 3 sizes. We always have to rationalize it by saying the ranges are good enough that you’ll find what you’re looking for in one of the 3 sizes offered so it’s okay that there are only 3 sizes offered. We don’t have to say that this time, and I’m glad Fatboy went the extra mile to make sure there was enough variety as far as sizes were concerned that everyone could truly find what they were looking for. Here is another area where Fatboy didn’t skimp on variety. Fatboy coolers come in 5 color options: sand, light blue, green, white, pink, and a special edition camo version. Here you might be slightly disappointed. At least I know I was. The warranty on a Fatboy hard cooler is 5 years from the date of manufacture. As for the parts and accessories, the warranty is only 90 days. I have a feeling this has something to do with the fact that Fatboy coolers aren’t made in America. The parent company instead outsources their manufacture to a factory in China. I guess that they can’t fully guarantee quality because of that. 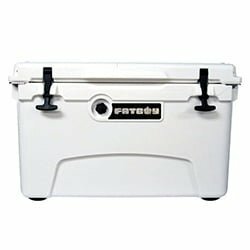 If I were to pick a con for Fatboy coolers, this would be it since many other brands (like Siberian or Pelican) offer lifetime warranties on their coolers, albeit limited. Fatboy coolers are perfect for tailgating, camping, and fishing. You can take them hiking, carry them to work on a hot day, and just about everything in between. 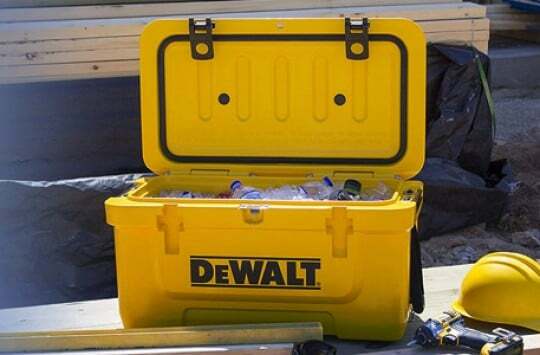 With this cooler, what matters isn’t the intensity of the activity, it’s the duration. 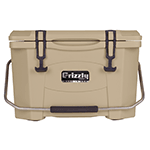 As long as you won’t be out there for more than a week, you can rely on this cooler to keep your ice icy. Anything past 10 days and you’re basically carrying a bucket of water. Fatboy isn’t a brand known just for making good hard coolers; they make pretty neat soft coolers as well. Here we’ve got the original Fatboy FatPack backpack cooler and the Fatboy FatPack HD cooler. Both were designed and developed to appeal to people looking for something that was both affordable and durable in the face of continued use in the harshest of conditions. 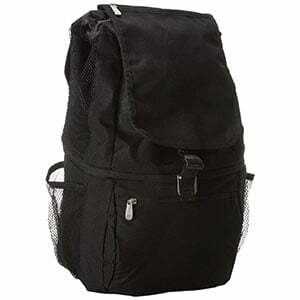 The Fatboy FatPack backpack comes with a bottom reinforced with EVA and an outer shell made out of canvas-like TPU. The waterproof layers also hold between them half an inch of high quality trademarked Blubber foam to keep everything cool, dry and safe. The insulation is pretty good because it maintains temperature very well when combined with ice. We also like the fact that the blubber also protects your gear, such as your phones, tablets, cameras, and so on. 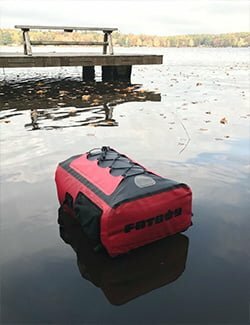 The waterproof integrity on the Fatboy FatPack means it can float very easily when you go kayaking and will not be damaged when submerged underwater or placed in shallow water. Be careful, though, don’t keep it submerged for too long or submerged in water more than 3 feet deep as it’s only built to deal with water under a certain level of pressure. The straps are well padded for full comfort when you’ve got a heavy load. As if that’s not enough, they threw in a chest strap for good measure. Fatboy is a recent player in the market, having begun operations in 2016 and is relatively unknown. Meanwhile, Yeti have made quite a name for themselves in the industry and are known for delivering the highest quality coolers. 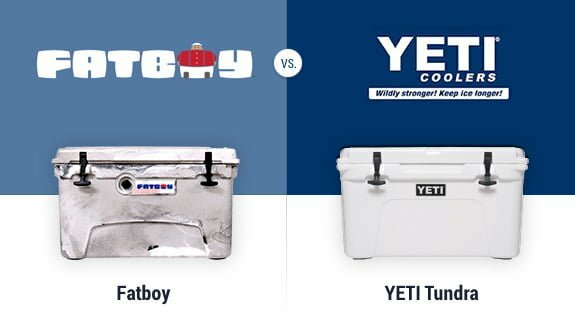 When it comes to durability, both Fatboy and Yeti are pretty durable and tough, though Yeti is certified bear-proof while Fatboy apparently isn’t. 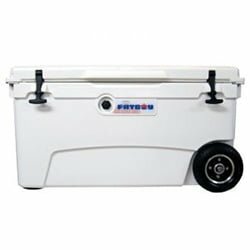 With Fatboy’s lockable corners, however, you probably won’t have to worry about any critters gaining access to your ice chest. 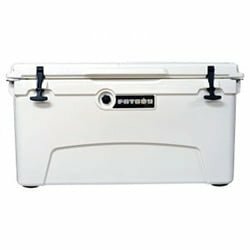 Fatboy is actually one of the rare examples of coolers out there that can match Yeti when it comes to variety in their offering with the many size and color options that they offer. You’ll likely be able to find a Fatboy that meets your needs just as easily as you’ll find a Yeti. The Yeti is more easily customizable, due to the abundance of third-party vendors selling customization accessories made especially for Yeti, like the stickers & decals, wheels etc. The Yeti also has better ice retention capabilities. I still think the Fatboy is good enough for most purposes, however, when it comes to ice retention Yeti seems to have an edge with their close to 3″ insulation. Yeti, of course, will always be Yeti. 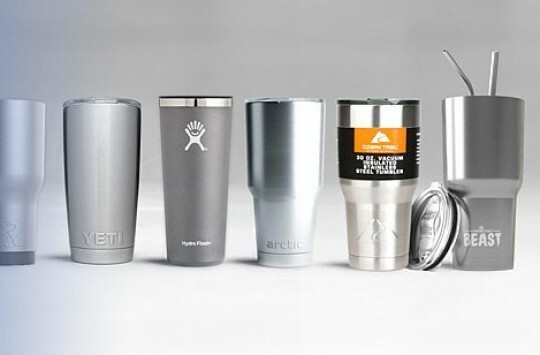 If you’re a die-hard fan, or only want to go for the tried and true, then, by all means, get yourself a Yeti. However, if you’re willing to try something new for a change, we think the Fatboy will give you great value for money. 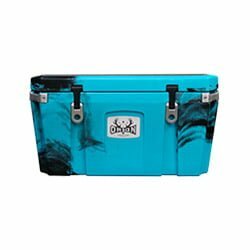 Where can you buy Fatboy Coolers? 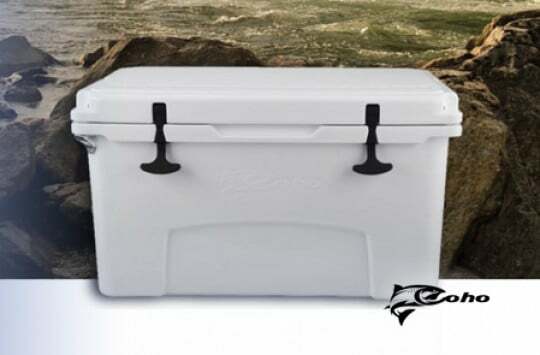 Fatboy coolers can be bought at lots of places online, including their own website. We, however, recommend that you make your purchase on Amazon. Amazon offers a wealth of advantages over other places. For starters, you get to read real-life reviews by other customers who have tried out the product before you. This will aid you in making a better decision about your purchase. Also, you’re fully protected and can return the product if you don’t like it and get a refund. You also get perks, such as free shipping if you’re a Prime member and many others. Fatboy Coolers are among the new kids on the block. As obvious underdogs, I think they try pretty hard and actually do a pretty good job at differentiating themselves from the competition. Their great features more than makeup for their weak points. If you want something new and are looking for great value, then you’ll absolutely love these coolers. 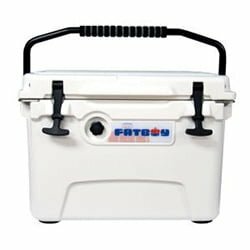 Fatboy Coolers, although not yet widely recognized, are surprisingly well made and offer plenty of features for the money. If you want something new and are looking for great value, then you’ll absolutely love their coolers.